Xyboard. It sounds like a xylophone made sweaty, mumbly love to a chalkboard. Putting that aside, the Xyboard is a pretty serious tablet with an IR blaster, boom-packing speakers, and hardware that screams more "stealth bomber!" than "another generic Android tablet you don't care about." 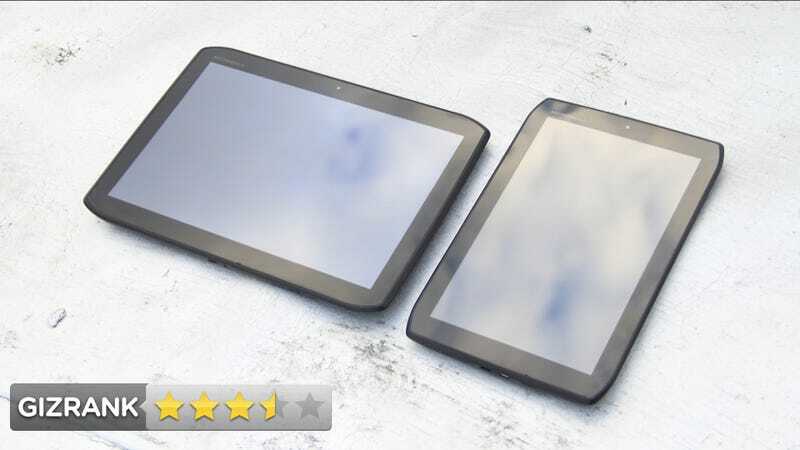 Motorola's first tablet—the first real Android tablet!—the Xoom, bombed. We were ready to like it, but well, couldn't. It was thick, heavy, and Honeycomb out of the gate was sticky and messy in all the wrong ways. This is Moto firing back, with not one tablet, but two. At 10.1-inch Xyboard for landscape-loving media eaters, and an 8.2-inch Xyboard for the person on the go. The build quality is excellent. The Xyboard is sleek, slim, and light, but feels totally strong. The back is predominantly aluminum, with black rubberized sides to make it grippier. The corners have been slightly shaved off, like a gadget circumcision. It has a splash-resistant nano-coating, so you can spill coffee on it, but not too much. The Xyboard runs the mildly-improved-upon Android 3.2, which still has the major pitfalls of Honeycomb, namely slowness. There's noticeable lag throughout the homescreen, though apps generally run pretty well once they're open... until there's too many open. The Xyboard 10.1 comes with a dumb stylus, which doesn't attach to it, doesn't work that well, and is really dumb. The Xyboard has an IR blaster for controlling your living room devices, and comes with Dijit, an app that acts both as guide and remote, neatly integrating full listings and descriptions of shows with the power to just go there instantly. The clipped corners and rubberized back make the Xyboard a joy to hold, even if it looks weird at first. The 1280x800 screens are nothing revolutionary, but they're good and bright, and colors are generally pretty accurate. The 8.2 can fit in a large jacket pocket, which makes it way more convenient to carry than say an iPad. Verizon's 4G LTE screams on these things, with download speeds averaging about 25Mbps and upload speeds around 7Mbps (plus or minus, depending on where you are). The speakers on both are the loudest I've ever heard on a mobile device. It's not the cleanest sound when maxed out, but the rumble and boom really added to the gaming experience when I was playing ShadowGun. The Xyboard's built-in remote powers, combined with Dijit, is really fantastic—it's like you've always dreamed of using your tablet on the couch while watching TV. It was even compatible with my Roku player, which other IR blasting tablets stumbled over. Despite their 1.2Ghz dual-core processors, speed remains a problem. There's some herky-jerkiness when scrolling that just shouldn't be there. This is the curse of Honeycomb, which, even after a year still isn't ready for primetime. While I like the way the design looks and feels, there are some glaring flaws, especially on the 8.2. If you hold the 8.2 in landscape mode (as you are likely to do when gaming or watching a movie) your hands cover the speakers. Similarly, if you're taking a photo in landscape (like you should be) your left hand will cover the camera. Really awkward. (The 10.1 doesn't have those problems.) Both Xyboards have the problem of difficult-to-find/feel/press power and volume buttons. Fumbling abounds and it's annoying. Battery life is a mixed bag. Standby time is very good, but I don't think you'll get anywhere near the claimed times of "up to 48 days on 3G; 33 days on 4G". If you've got the radios off and the screen set to half brightness, you can play on these for about nine hours. If you're streaming video over 4G, you'll be lucky to get four hours. The 5MP rear-facing cameras are okay in bright sunlight, but indoors shots are washed out, bland, and flat. Since a rear camera on a tablet is fairly pointless anyway, that's not much of a ding. The front cameras are fine for video chatting. If you want a 10.1-inch tablet, there aren't really many compelling reasons to buy this over the Transformer Prime, unless you really want the freedom of having 4G radios or an IR blaster. For about the same price the Transformer is just faster, more future-proofed, and has better battery life. The 8.2 makes a decent case for itself, however. It's got the 4G radio and IR blaster, but it's super portable, and it packs the same resolution into a smaller display which gives it a higher pixel density. If you're intrigued by these puppies, that's the one to get. All that said, you should hold off until we see A) what is announced at CES, B) when that Ice Cream Sandwich update is coming, and C) how said update affects performance. Even at the subsidized price you get with a new Verizon contract, these aren't cheap, and the monthly data cost is something to factor in as well. Hold off for now.